What specs for 4K editing. I'd like to pick up a used computer (PC or Mac) that is fast enough to edit very short 4K video clips, generally less than 1 minute. Someone, on this forum or another, suggested that I pick up a used gaming computer, but I have no idea what specs constitute a gamine computer. I'm not well versed in computers, but I've used both PC and Mac. The only thing I've done internally to a computer is upgrade the memory in my macbook. I don't need a 4K monitor, just something that is fast enough to play the video without making it choppy. Also, do PCs come with any free editing software like macs. I'm using iMovie to trim the clip, remove audio, and export as 4K ProRes movie. That's all I need it to do. Thanks. Re: What specs for 4K editing. and export as 4K ProRes movie. That rules out PC. 4K is still overrated for most people. Also you never quoted your budget. Hey Larry, referencing another one of your threads here - on your current computer, what are you playing the 4K ProRes clips from? Internal storage, external hard drive? The data rate of 4K ProRes is quite high, so before you spend big money on a new computer, make sure that the pipe you're trying to play the clips back from is sufficient. I record in 4K on a Lumix FZ 2500. I import them into iMovie on my computer. I edit them. Each clip is no more than one minute. After I edit (trim the ends and remove the audio) and export, I move on to the next one. I have no intention of spending a great deal of money on a new computer. I intend to search for used one. As I stated I'm looking for a used gaming computer. I assume that means a computer with a fast video card, but I'm unsure. I'm not sure what you're referring to when you say, "pipe". So you're currently importing to an internal hard drive on a Mac? What I mean by pipe is the way the video is stored when playing it back. If you're editing off a USB 2.0 hard drive for example, the very method of connection may be too slow to play back ProRes 4k (at least 471 Mb/s for 24p). In that case, you might be able to upgrade internal storage to SSD for a fraction of the cost of a new computer. Try this too: open up activity monitor and play back a ProRes video. If your CPU maxes out on the little chart, you'll know where the problem lies. OK, I'll play along provided someone address my initial question afterwards. I ran the Activity Monitor (a first for me) while playing a very short 4K video, as you suggested. The VTdecoderXPCservice rose and spiked above 100% during the playback. What does that mean. And how do we know that it's not my video card, which I understand can't be switched out. Specs of my computer are shown below, but I've upgraded to 8GB memory. Is iMovie considered online or offline editing. Your budget is probably too limited to buy a proper used mac, so it's best staying with what you have. I'd get FCPX, work off the internal drive and edit with a proxy. Exporting to 422 4k is overkill mpeg4 should be sufficient. Will it play smoothly to your liking hard to say but your options are limited. You also might need to lower your sights to 1080p. Realistically 4k workflow might not be right for your budget. Hey Larry, I believe I understand what you're needing to do - play back the ProRes files to proof them before uploading to Pond5, and not necessarily "edit" the clips in any significant way. iMovie would not be considered "offline" editing as you're using the original files, not generated proxy files (as you can do in FCPX). I dug out my 2007 white MacBook, with a similar 2.16Ghz Core 2 Duo processor and tried playing back a 1080p ProRes file and also a UHD ProRes file in Quicktime. Both 24p. Playing back the clips from the internal drive off the desktop, I was JUST able to view the UHD file with minimal skipping IF I resized the playback window to the minimum dimensions. This makes me think that your computer should also be able to play back the clips for approval purposes. Though perhaps not at full-screen. Thanks for the reply. I would certainly consider buying a proper used mac if I knew what specs were needed. I would also consider keeping what I have if I knew how to upgrade it to meet my needs. I have no intention of down-ressing to 1080p before uploading to Pond5. I want to offer 4K and HD. I like the idea of using Final Cut Pro X (had to look up that acronym) and editing a proxy file. I edit my stills in lightroom using proxy files (smart previews). Please don't assume that you know my budget. Budget has nothing to do with the (minimum) computer specs needed to meet my needs. Precisely. I'm "editing" for upload to Pond5. Trim the ends, delete the audio, upload. You didn't have to dig out your old mac. Thanks. My 4K is choppy when viewed at its smallest size in Quicktime and iMovie. What are your thoughts of the Activity Monitor results that I posted. What can you conclude from them. A used Mac Pro 2009 or newer with an upgraded graphics card will run you around $1,500. There are other Mac options in that price range. Oh I now I get it you're trying to make a living selling stock footage. When I saw your wildlife thread it seemed a bit odd jumping into a line of work without any prior experience. I'd be interested to see if you can make a go of it. Seems like it could become a bit of a gold rush. Last edited by Pete Cofrancesco; February 13th, 2017 at 08:36 PM. 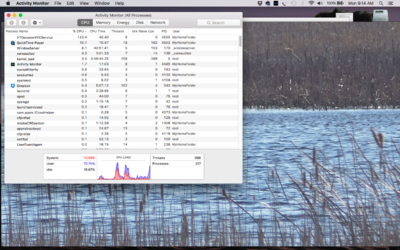 Now consider that this is on OSX 10.12.3 Sierra, which to my knowledge relies more heavily on the GPU to play back H264 video, so the CPU usage of ProRes via H264 may be a little skewed in that regard because of my computer situation, but you're seeing about what it takes for playback of a full-resolution 4K video file in Quicktime. For CPU usage, my 2015 MacBook has 4 multi-threaded cores, so that equates to up to 800% of total CPU "capability" in the Activity Monitor. A single multi-threaded core (like the one in the 2008 MacBook Pro) would have up to 200% theoretical capability (as far as I understand these things). Your Activity monitor photo seems to confirm this. In FCPX, for example, the player window will automatically reduce the playback quality to 1/2 or 1/4 resolution when the application senses that it's dropping frames. This in turn reduces the load on the processor. When you're editing and want smooth playback the quality hit isn't a problem at all, because whenever you pause the video the full resolution image returns so you can check sharpness and the quality of the picture. The "offline editing" workflow you were referencing before is similar in this regard because you are essentially replacing the video files temporarily with a separate set of 1/4 resolution files and forcing the editor to use them all the time. BUT offline editing is not really useful for proofing files before delivery nor is it available in a low-cost/free program like iMovie. Ok, stay with me, I think this might be the home stretch - I dropped my 4K ProRes test file back into iMovie (essentially your "final" trimmed files destined for Pond5 you would have already exported from iMovie once) and watched them back in the playback window. Looking at the Activity monitor, it read a pretty consistent 125%. Could this be a method that works for your current setup? By using iMovie as your playback application, and allowing it to drop the resolution during playback, you may just be able to eke out enough performance to check the smoothness aspect of your files, and then pause the video periodically to spot-check sharpness and image quality. Kind of an extra step, but beats dropping cash on an upgrade if it actually ends up working for you. The other option I suppose is just trusting your footage and uploading to Pond5, then later checking their online player before sending the files off to the curator. Or render out a temporary 1080p version from iMovie for quality control purposes. There's really very little chance your actual video files are choppy, since playback quality won't affect the actual renders. If all else fails, bring your FZ2500 memory card to a local Mac retailer (Apple Store / Best Buy / etc) and see which computer does the job for you. I have a feeling anything made within the last few years with a i5 processor or better should do the trick. Good luck! No Pete. You don't get it at all. Magix vegas pro has proress output capability on a windows pc. You need a PIXAR server farm.